I can't get enough of the HORNET series! 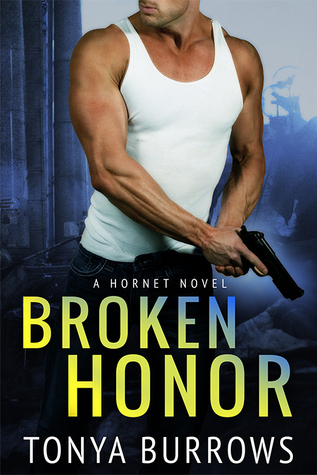 Broken Honor is the third installment in the series and the much anticipated story of Quinn, Gabe Bristow's (SEAL of Honor) best friend and second-in-command. The plot was fast-paced and kept me turning the pages. Tonya Burrows has the ability to pull the reader right onto the front lines of the action and drama, and I loved every minute of it. The story was packed full on emotional ups and downs thanks to Travis's conflicting emotions and Mara's inner turmoil of loving a man that can't accept their future child. There was also several pulse-pounding twists and turns that took me by surprise. Travis Quinn is a dominating, strong alpha hero who is honorable to the core, but he is also a heart-breaking character. He had a rough childhood with an abusive father and then once he finally found a happy home with his adoptive parents they were tragically ripped from his life. Travis eventually finds his place in life in the Navy, and then later HORNET, but he can never seem to hold onto anything good. Which is why when he meets Mara he keeps leaving her... before she can leave him. His actions throughout the story were both frustrating and heart-rending. I couldn't help but relate to him. Mara is HORNET team-mate Jesse Warrick's cousin, and such an easy character to like. She made a wonderful heroine for the story that I enjoyed reading. Despite Mara's accepting nature, she refuses to let Travis walk away from her and their unborn child without a fight, but will accept nothing but his all. As the plot turns to rescuing Mara, the whole HORNET team gets involved. Don't think that just because a few of these ex-military men have already had their stories told that we won't see some major developments with them. Because we do, and some of them will just about rip your heart out. Though Broken Honor didn't have as much sizzle as is predecessors, it still had everything I look for in a romantic suspense. This is a thrill ride you won’t want to miss! "Yes, living with him wasn't easy. But loving him? That was the easiest thing she had ever done, and she wouldn't have him any other way." I just love those alpha heroes...and this one sounds like a keeper. I have been wanting to read a bit more Romantic Suspense...so I will need to pick this one up and SOON.